It’s time West Seattle, time to restore our murals. 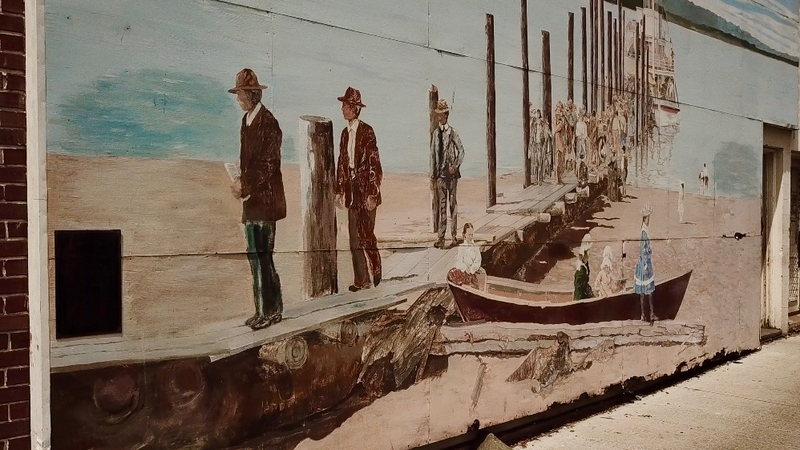 Longtime West Seattleites may look at the murals as treasures that illuminate our past. Newcomers may wonder how they came to be. 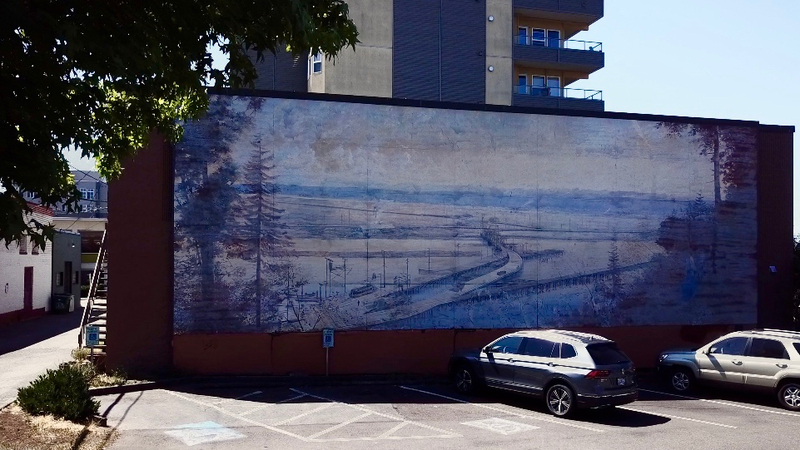 But no matter how long you have lived here, you likely have noticed the increasing deterioration and attrition of the Murals of West Seattle. 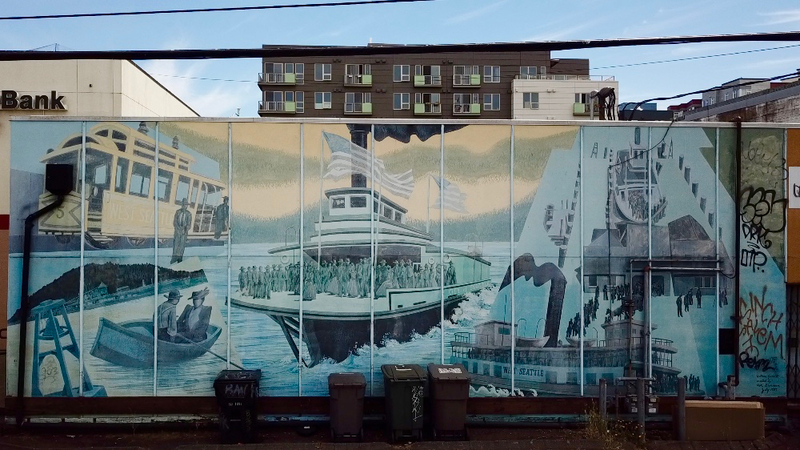 In the decades since the 11 Murals of West Seattle were created, these unique pieces of artwork have brought to life the rich history of much of the Duwamish peninsula. 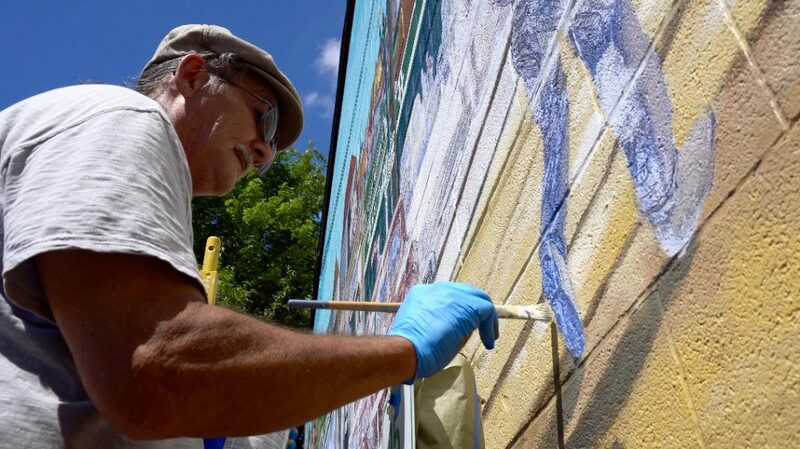 The murals provide unique zest for the area’s identity and are the very definition of tangible community-building. While the murals still provide inspiration, on the whole they are not in great shape. One severely deteriorated mural was abruptly removed when the owner of the property on which is stood deemed it an eyesore. Extensive graffiti tagging has taken place on three other murals in recent years. Shadowing these owner decisions and instances of vandalism is the pall cast by the ravages of the elements. Sun, wind and rain, along with the growth of nearby vegetation, has conspired to reduce even the most vivid of the murals to mere echoes of their former beauty. Mosquito Fleet was restored in 2018. 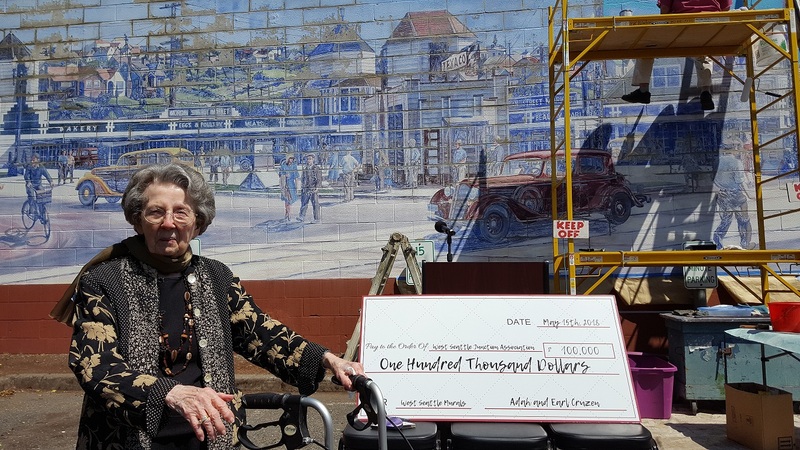 This mural restoration is funded in part by a West Seattle Garden Tour generous $5,000 grant. 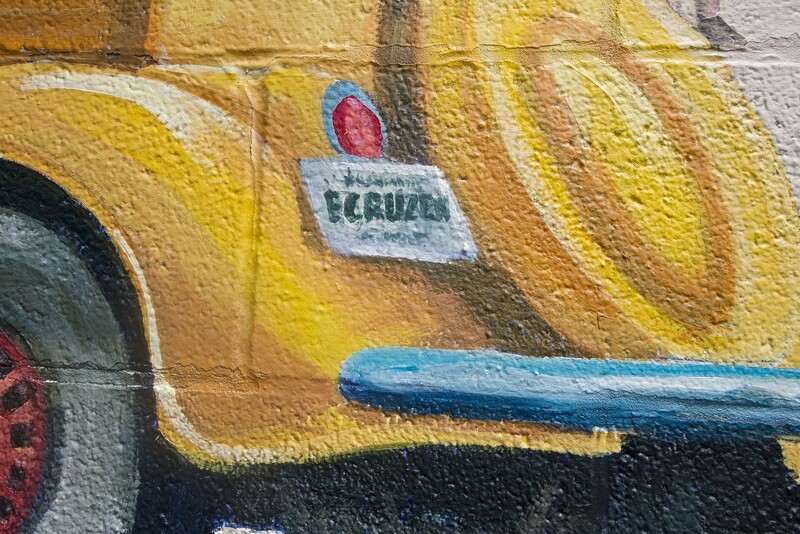 The Murals of West Seattle project was led by longtime local business leader Earl Cruzen in 1989-1993. 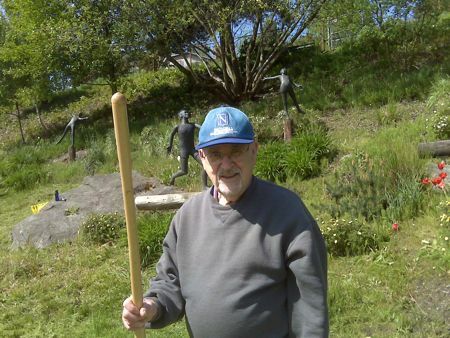 Earl was a persuasive pied piper in the West Seattle business community, drumming up bare walls, funds from generous building owners and the key ingredient of enthusiasm to bring the project to fruition. Part of the excitement was the ability for everyone to watch the murals come to life and to interact with the visiting muralists as they did their summertime work day after day. The result was 11 unique art pieces, and for more than a quarter-century, the murals have brought to life the rich history of much of the Duwamish peninsula – the very definition of tangible community-building. In 2018 we have received a generous gift from Adah Cruzen, the widow of Earl. The funds will serve as a match for the community fundraising. Together we can not only restore the murals to their former vibrant glory, but replace the mural that was removed in 2016. 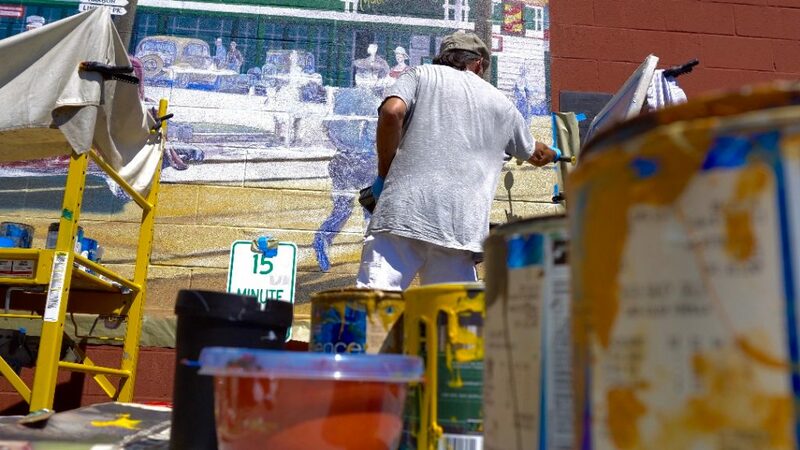 We’ve already renovated the Morgan Street Market Mural, but we have a long way to go. Our hope to also have funds to keep the murals free of graffiti, but to also begin a foundation fund for the vision of future murals in West Seattle. We hope you can help us! COMMUNITY CHALLENGE: Between March 15th and June 15th, we’re challenging 88 people to donate $250 (or more!) to help restore the mural. Future Murals – 2019 and beyond. or securely via the donate button. Want to create your own Mural fundraiser? You can! Just click on the Join the Team button. You may also donate stocks by completing the Donation of Securities WSJA form. Donations of $500 and above will be recognized on plaques that will be secured next to each mural. The Junction is a registered 501(c)(3) your donation is tax deductible EIN #91-1403639. 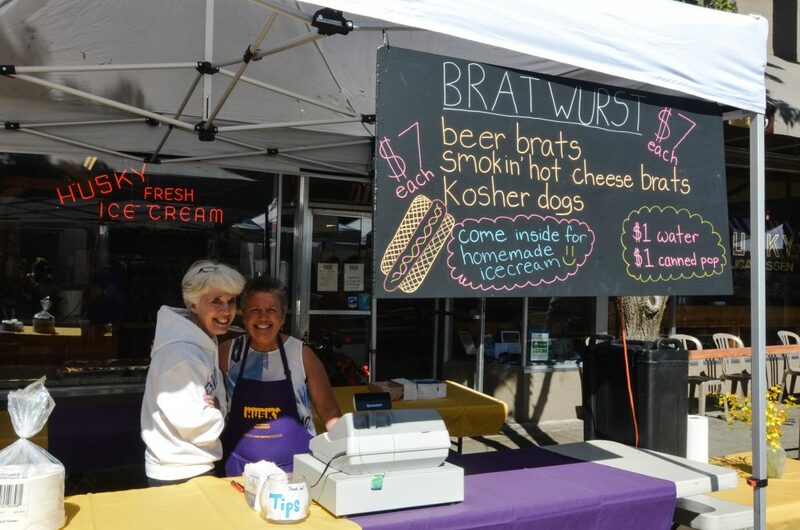 Shopping at Summer Fest is one of the many reasons people from all around the region visit West Seattle over the 3-day festival. 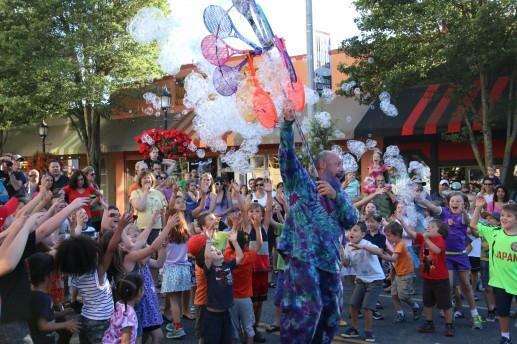 Now in the festival’s 36th year, Summer Fest started as a merchant sidewalk sale. 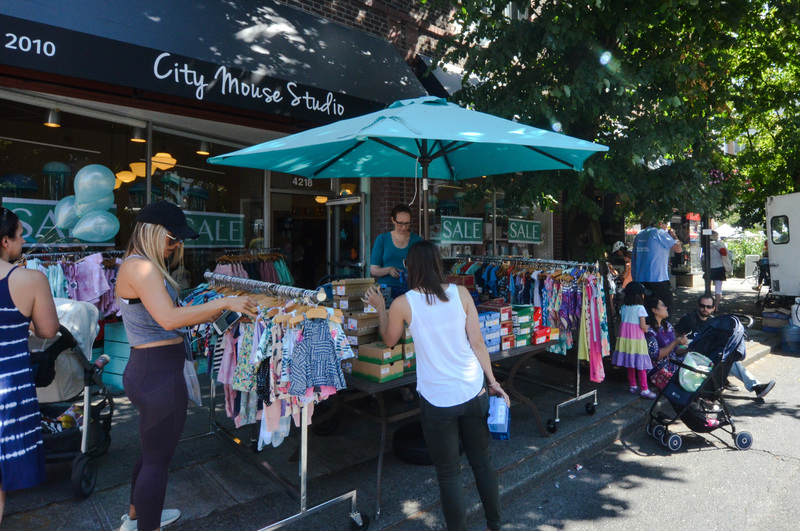 Many of the West Seattle businesses still hold that tradition true by offering sidewalk sales throughout the event. Some of our recommended highlights are the famous Easy Street Records sale – there’s always plenty for everyone! Zamboanga has imported clothing from around the globe. Fleurt and City Mouse offers everyday clothing and decor for gift giving all-year round. There’s plenty of sales going on throughout the festival. Click! Design that Fits sidewalk sale! Starting Friday morning they’ll set up outside with seriously marked down clearance and overstocked items such as furniture, lighting, and some super cute baby clothes! There’s a sale corner inside too, and they still have a few Hobo bags and wallets 25-50% off! West Seattle Verizon will be offering $50 off all Android phones in addition to a buy one get one free promotion Verizon is offering on the newest, Apple, Samsung, Pixel2, LG and Motorola phones (requires one new line of service) and also free activation (saves $30) on new lines of service. Menashe Jewelers will have their famous sidewalk sale tables selling treasures from around the globe. The Whittaker will be waiving Security Deposits and offering 6 weeks free to anyone who stops by and mentions they saw them at Summerfest. Thursday, July 12, 6:00-9:00, Carmilia’s will kick off our summer sale with a pre-function party. We’ll have drinks and deals aplenty; you don’t want to miss this! The fun and deals (and drinks) will continue all weekend. Funky Janes is offering 25% off the entire store starting at 5pm on Thursday and continuing through Sunday. Friday, Saturday, and Sunday we will offer 50% off items. Virago Gallery is having a SUMMERFEST SALE! 20% to 30% off select jewelry and 50% to 75% a selection of Saltiare Life Vintage Kimonos! HEYYYYY!!!! Runs through July! Capers: West Seattle tshirts and locals nights. VAIN is hosting a large photo booth (up to ten people) on their sidewalk from noon – 4pm during West Seattle Summer Fest. The traditional style four pose color photo strip will be just $5.00 with all of the proceeds going to benefit the Senior Center of West Seattle. There will be Senior Center folks on hand to collect donations and talk about volunteer opportunities. VAIN will also have 10%-30% discounts throughout their boutique. We hear they have held back some great new merchandise that they will be rolling out starting on Thursday night during the West Seattle Art Walk. The semi-annual 50% off Discovery Shop storewide sale (except plants) will be during summerfest. The plant arrangements are created by volunteers of the shop and their friends. Click on the full shopping list for all of our Summer Fest vendors. 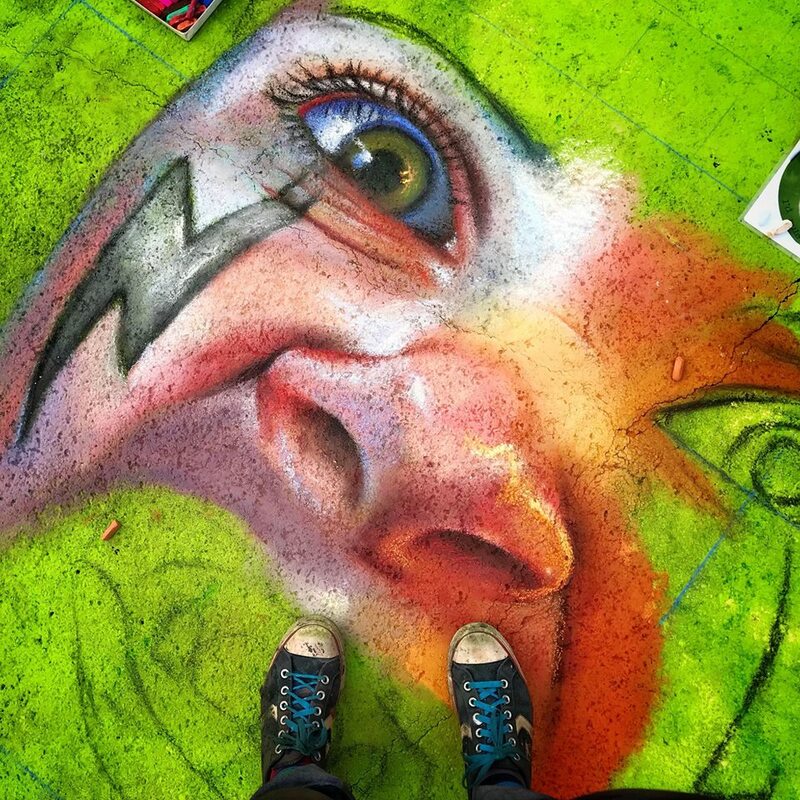 Art Walk + West Seattle Summer Fest! The West Seattle Art Walk is doing something extra special for the July 12th Art Walk, also known as Summer Fest eve! They issued a call for artists to create chalk art on the streets in the Junction and have selected 11 artists. Here’s a sampling of the artwork of the artists you’ll meet this Thursday. Artists will be laying down chalk from 6-9pm. There will also be chalk for kids to color the streets. Come out for Art Walk and make sure to join us for this interactive art experience! While you’re in the streets for Art Walk, make sure you swing by the West 5 for their 15 Year Anniversary. 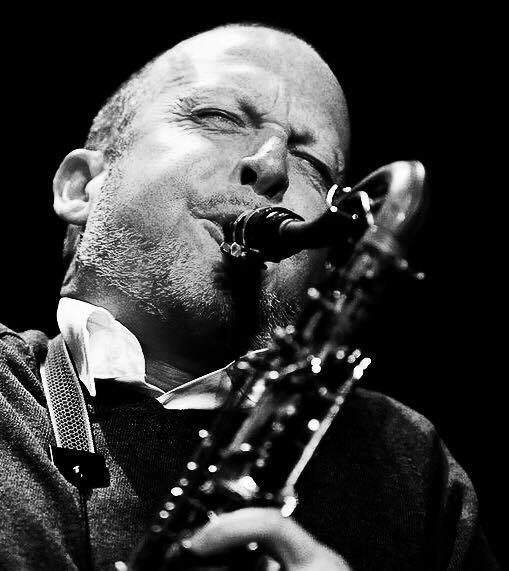 The Yada Yada Big Band will be throwing down some tasty tunes 7 PM to 9 PM. We’re not giving too much away, but you may also want to stay in the Junction for a surprise in the streets – 7 PM. 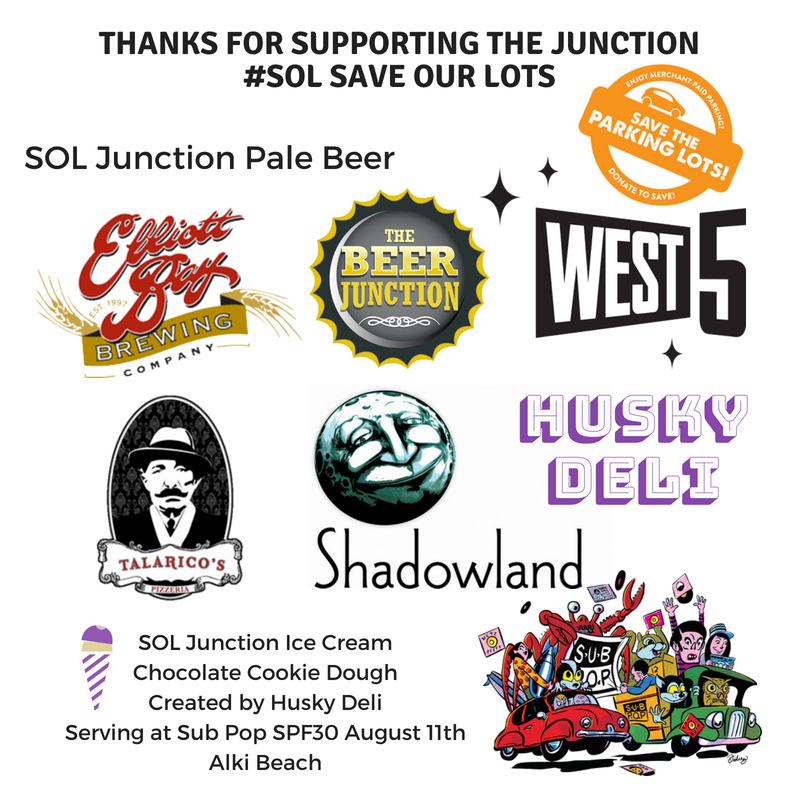 While you’re at Summer Fest watch for the new SOL (Save Our Lots) Junction Pale. Brewed by award-winning Elliott Bay Brewing, you’ll find this a refreshing brew to quench your festival thirst. You’ll find #SOL at the Beer Garden, Elliott Bay and The Beer Junction. We’ll have plenty of music throughout the festival, including buskers, live music at Verity Credit Union and other pop-up locations. Check out music from the full line-up on the Summer Fest band page. Find out more about the music line-up on the official Summer Fest website, Summer Fest Facebook page, on Twitter, on Instagram and on Snapchat wsjunction. 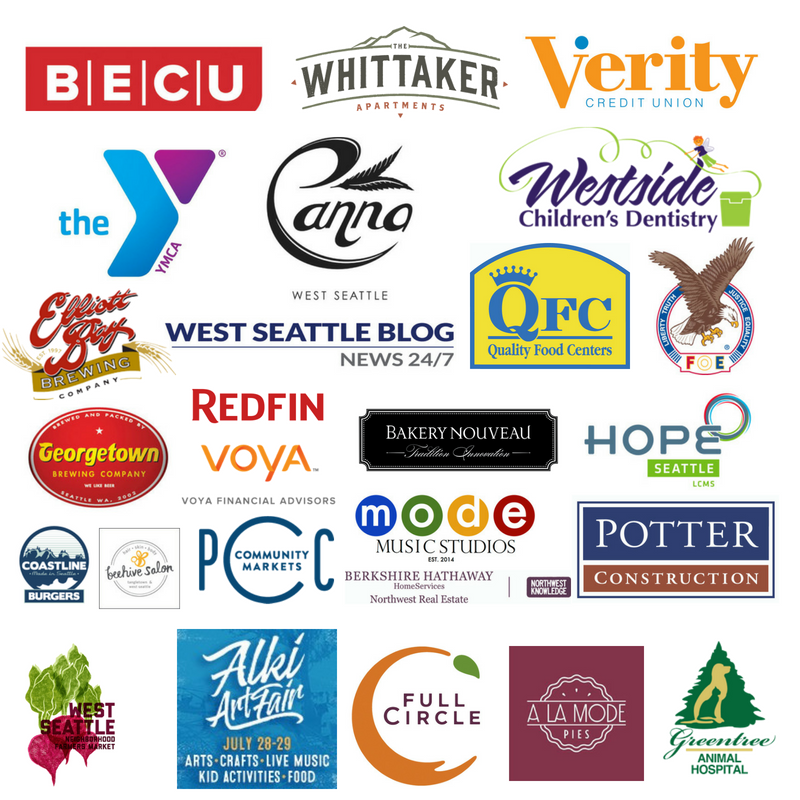 Thank you to these Summer Fest sponsors! 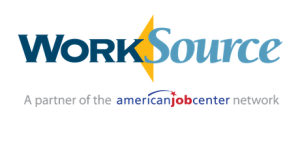 Raise a glass and raise funds for the Junction with a pint of SOL Parking Pale, brewed locally by Elliott Bay Brewing Company. For the 2018 Summerfest, we poured the brand new “Save Our Lots Parking Pale” which sold out! You can find SOL at Elliott Bay Brewing, The Beer Junction, West 5, Shadowland and at Talarico’s Pizza. “SOL Parking Pale” (a hazy pale ale) was brewed to help the fundraising efforts of our beloved 3 hour free parking lots in the Junction Area (a large property tax increase now threatens the future of the lots). $2 of each pint sold will go directly to the West Seattle Junction Association, the nonprofit 501(c)3 that pays for the lots. You can also find out more about this campaign from the West Seattle Blog Article HERE. This fund-raising summertime beer is a hybrid, somewhere between a session style pale ale and a hazy light wheat. Its citrusy aroma and quaff-ably refreshing finish make it the perfect beer to enjoy during these dog days of summer. 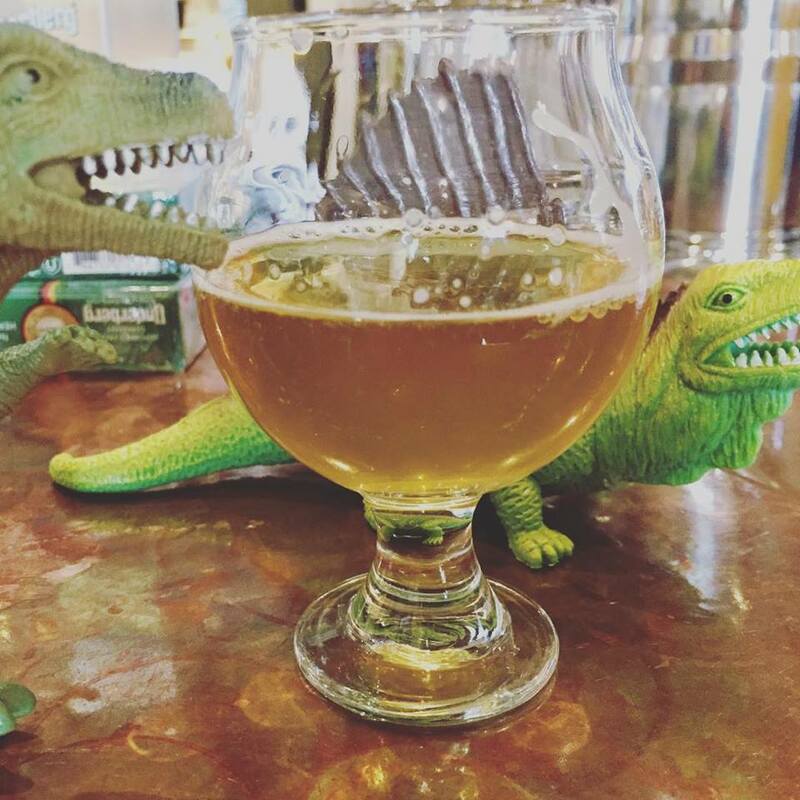 Organic Washington-grown Amarillo and Simcoe hops plus a touch of NW wheat make this beer so enjoyable and balanced. Who Else is Supporting This Fundraiser? Our beloved Husky Deli for of course! The SOL ice cream was available during the August 11th Sub Pop SPF 30 celebration down on Alki Beach. You never know though, you may see it in the Junction. Just keep on checking! Want to start your OWN fundraiser? Community groups and businesses can! See what’s in the SOL Fundraiser Kit. Summer Fest Beer Garden was sold out by Sunday! Bootcamp and Brews August 30th and 31st! hosted by Fitness Revolution with Jill and The Beer Junction. Exercise for a cause! 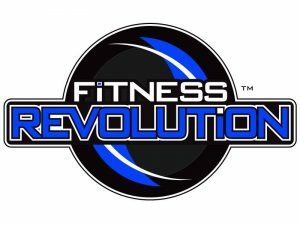 Fitness Revolution and The Beer Junction have teamed up to bring you Bootcamp & Brews. A fundraiser for the Junction FREE community parking. Spend 50 minutes with Jill working up a sweat, then reward yourself with a refreshing SOL (Save Our Lots) Junction Pale next door at The Beer Junction. Maximum of 20 people per class, so grab your friends and exercise your right to raise funds and a tasty pint for a good cause! You can raise a pint and/or donate now though a handy and secure button verified through Guidestar and Network for Good. 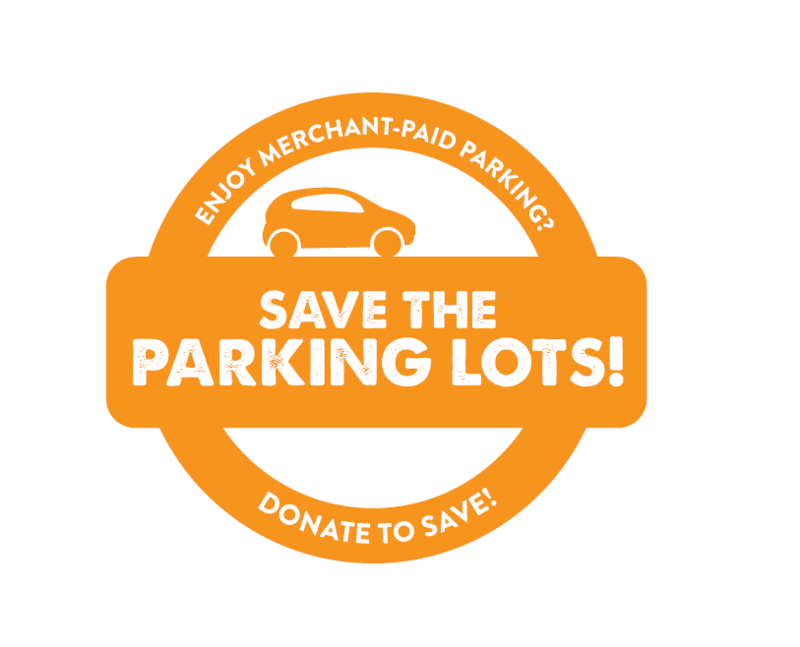 We want to thank Nick Bers Design for the SOL Save our Lots Design. You can find him on his website and on Instagram. In partnership with Podcast: West Seattle, the Junction is pleased to bring you news, stories and in-depth interviews through local podcaster Andrew Stucky. The West Seattle podcast explores history, the arts, culture, and current events on the Duwamish Peninsula. You can find the Podcast: West Seattle on Soundcloud and iTunes. Part 2 of Andrew’s visit with Matt at Easy Street, a look at hidden West Seattle parks with Linnea Westerlind, and music from Forget Me Not. Music from Trick Candles, Matt Vaughan from Easy Street Records, West Seattle Library Events, and the upcoming Arts West season. 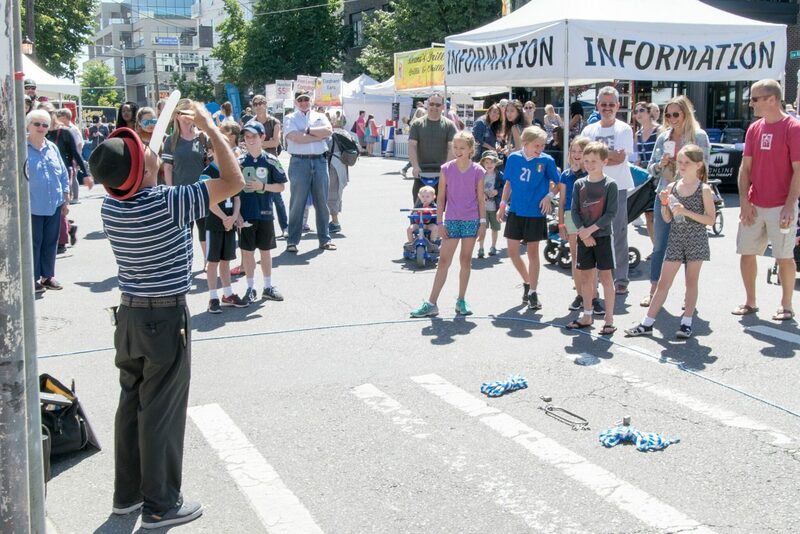 In our first Junction episode, the Podcast: West Seattle focuses on Summer Fest, July 13th – 15th. A preview of Summer Fest ’18! Podcast: West Seattle visits with Falafel Salam and Elliot Bay Brewery, a chat with the School of Rock house band, some history through Easy Street Records, music from And Friends, a quick check-in with the West Seattle Art Walk and much much more! 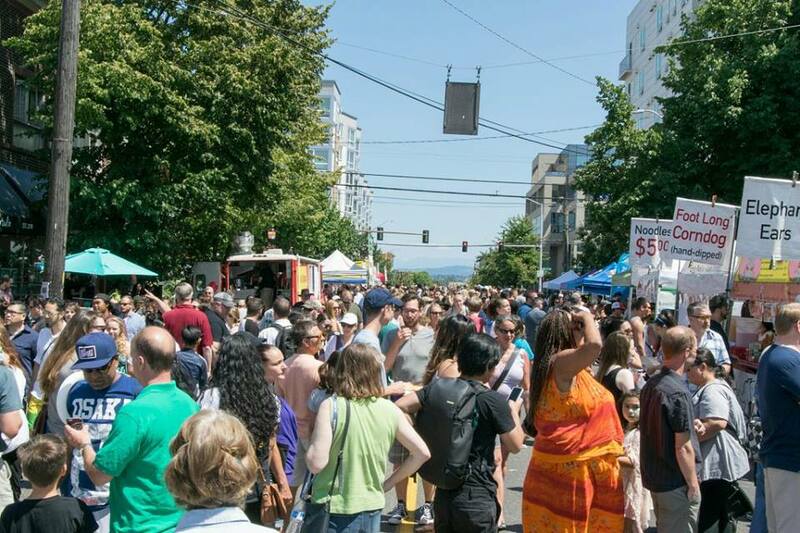 Join the biggest street party of the year in West Seattle. Busk at Summer Fest, 2018. Complete the busker form for your placement. 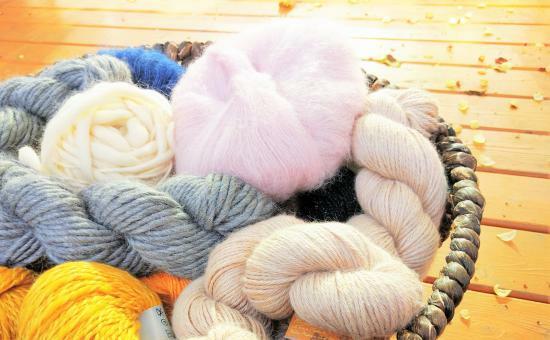 This workshop can be a great intro to knitting or simply a fun get together for the kids where they can learn some new skills and create something unique. The workshop is suitable for ages 8 to 10. After a very brief introduction about knitting arts and learning some fun facts about fibers, yarn and knitting tools, the kids will learn and practice finger knitting by completing a couple of fun projects. We encourage to sign up as soon as possible to reserve a spot. to us that we are communicating clearly with you, the neighbors. • Event hours are from Friday, July 13th 10am to Sunday, July 15th 5pm. • We will be loading in beginning at 6pm on July 12th, and will load out until 11pm on July 15th. • During the event hours, we expect between 5,000 to 15,000 attendees per day. 4pm on July 12th through 11pm on July 15th. See the attached map for specifics. to 4pm on July 15th. event. Our goal is to create an enjoyable and positive experience in your neighborhood. See PDF of notification here.